This project, a blind spot detector from 2003, continuously monitors the blind spots in a car mirror giving visual feedback if there is a car beside you. The design uses infrared light to check the blind areas around a car and measures reflected light to check if there is a vehicle in the blind spot area. 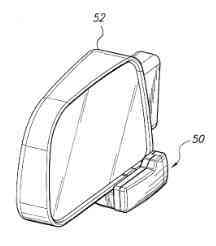 It provides quite a neat solution since the measurement and reporting system is all contained within the wing mirror housing. The innovative part of the design is that it does not use just one IR led but four, and the power level is stepped over a 100ms period. This is quite different to the usual method of detecting the returned signal levels (the lower the signal level received, the further away the object is positioned). Instead the power level is adjusted to see if any signal is received at a specific power level. The IR sensor is used at maximum detection level (you can't change that anyway) and the distance to the object is figured out by the current power level setting (when a signal is found). So, really, this design saves you from having to design an infrared amplifier - quite a difficult task - and instead uses an off the shelf IR detector! 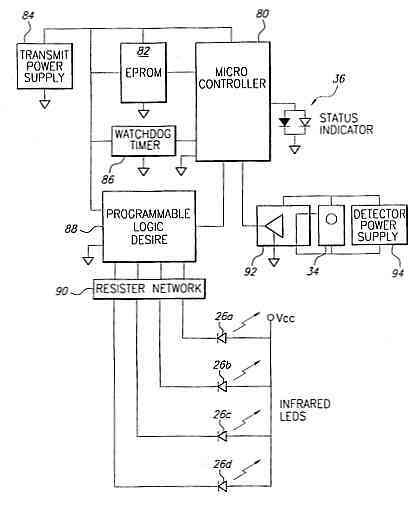 A blind spot detector system adapted to the exterior of a vehicle comprising at least one infrared light emitting diode (LED), an infrared photodetector and demodulator, and a microcontroller. The output power of the infrared transmitter is linearly modulated, enabling the blind spot detector to determine the proximity of the detected object. Furthermore, the transmitter output is frequency modulated to screen out random infrared radiation that might adversely affect the operation of the infrared photodetector. The system is calibrated to the position of the attached vehicle by linearly increasing the output power of the transmitter until the rear quadrant of the vehicle is detected when the transmitter is outputting power at a pre-determined calibration level. During normal operation, an object detected while the transmitted power is greater than a predetermined lower threshold and less than the calibration level will activate a LED indicator on the system housing. 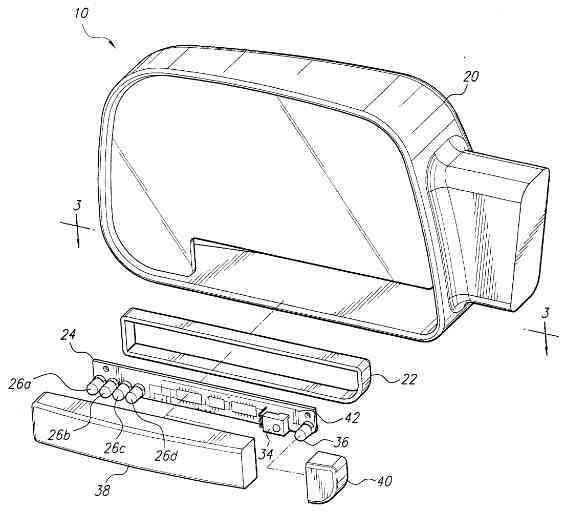 The present design relates to vehicle safety devices, and more specifically, relates to a system for detecting objects in a vehicle's "blind spot". A common problem to the operators of motor vehicles is the difficulty in detecting other vehicles or objects in the "blind spots" of the vehicle's operator. A common blind spot is to the rear left of the operator's seat, and a right-side blind spot extends outward from the rear right quadrant of the vehicle. Both of these blind spots are the source of numerous accidents when the driver makes a left or right turn or a left or right lane change. Vehicle manufacturers have sought to overcome these blind spots through the use of left and right side-view mirrors, however, several limitations have prevented mirrors from adequately resolving the problem. First, the mirrors do not necessarily reflect the true position of the object in the mirror. Mirror manufacturers have attempted to give the driver a wider angle of view at the price of having a smaller reflection, giving the operator a false sense of distance. Second, nighttime use and adverse weather conditions limit the effectiveness of externally mounted mirrors. Third, a vehicle may have several alternate drivers, each requiring different physical positions of the mirror. However, a driver may neglect to adjust the mirror after taking control of the vehicle thus forsaking any benefit the mirror may provide. Alternatives to mirrors for detecting the presence of vehicles or other objects in the driver's blind spot include both active and passive devices, such as radar detectors, cameras, ultrasonic transmitters and detectors, and infrared detectors. The blind spot detection system is adapted for mounting to the exterior of a vehicle to sense the presence of obstacles within a vehicle's "blind spot" and to generate a signal to the vehicle's operator indicating the presence of the object. The detector system includes a housing containing an operative circuit board, a side view mirror that has been adapted to receive the housing, at least one infrared LED, an infrared photodetector and demodulator, a microcontroller, a memory, program instruction code, and circuitry interconnecting the aforementioned elements. 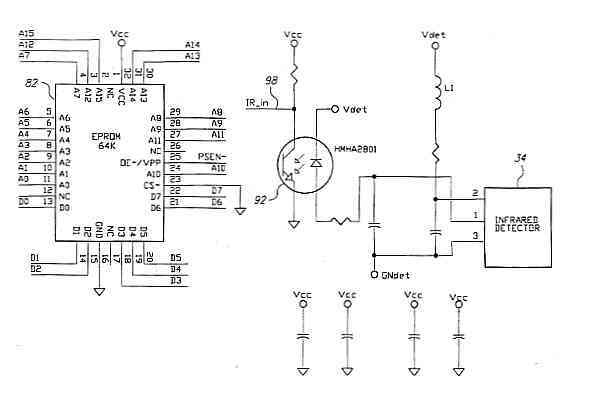 Under control of the microcontroller, the transmitted infrared power amplitude is linearly modulated, whereby the distance to an object can be determined by analyzing the point in time at which the reflected infrared light is detected by the infrared photodetector. Additionally, the infrared power is frequency modulated and the received signal is demodulated to screen out random light radiation that might incorrectly trigger the infrared detector. Upon application of power, the system enters an initialization phase in which the system is calibrated with respect to its position on the vehicle by linearly increasing the output power of the infrared transmitter until the rear quadrant of the vehicle is detected at a pre-determined output level which will be designated as the "Calibration Level". In operational mode, the output power of the infrared transmitter is continuously modulated between the "Calibration Level" and a pre-determined lower threshold designated the "System Integrity Level", whereby an object detected while the transmitted output power is greater than the "System Integrity Level" and less than the "Calibration Level" will cause a flashing red LED to be illuminated, signaling to the operator of the vehicle the presence of an object. Detection of an object at a transmitted power level at or below the "System Integrity Level", or failure to detect the rear quadrant of the vehicle at the "Calibration Level" will result in a steady red status indication that the detector system is non-functioning. Accordingly, it is a principal object of the design to provide a blind spot detector system that has an automatic built-in test capability that continuously monitors the calibration of the detector system. It is another object of the design to provide a blind spot detector system that can detect the approximate distance to an object. 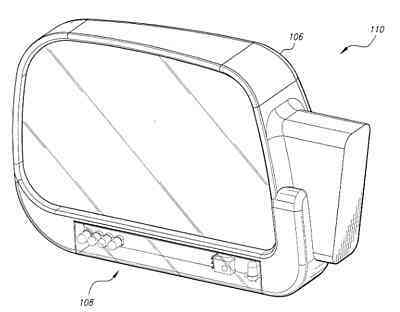 Still another object of the design is to provide a blind spot detector system which can be removably attached to vehicles and other objects. It is an object of the design to provide improved elements and arrangements thereof for the purposes described which is inexpensive, dependable and fully effective in accomplishing its intended purposes. These and other objects of the present design will become readily apparent upon further review of the following specification and drawings. As shown in FIG. 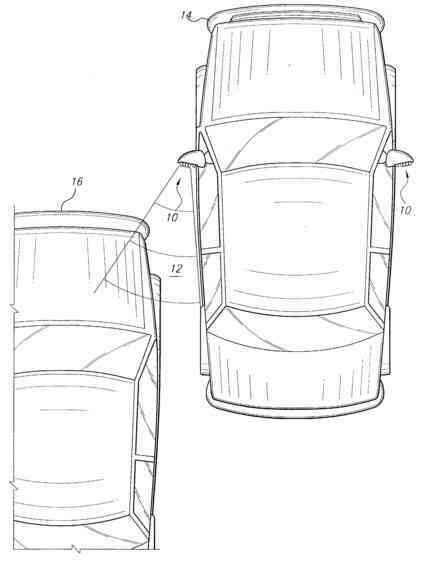 1, a blind spot detector system 10, mounted on the exterior of a vehicle 14, utilizes light emitting diodes (LEDs) to reflect infrared light from an object 16 in the vehicle's blind spot 12. The reflected light is then detected and a visual indication is presented to the operator of the vehicle 14. The LEDs and infrared detector are frequency modulated at approximately 40 Khz to screen out unwanted light energy. As shown in FIG. 2 and FIG. 3, the detector system 10 comprises a side view mirror 20 adapted to receive a housing 22 containing circuitry 42 disposed on a circuit board 24. Mounted on the circuit board is at least one infrared LED, 26a-d, an infrared photo detector and demodulator 34, and a bi-color indicator LED 36 that illuminates green when the detector system 10 is active and operational, solid red when the detector system 10 is out of calibration, and flashes red when the detector system 10 has sensed an object 16 within the vehicle's blind spot 12. Although the present embodiment is shown having four infrared LEDs 26a, 26b, 26c and 26d, the detector system 10 is not limited to a specific number of LEDs, and other embodiments with more or fewer LEDs are envisioned. However, it will be noted that by using four infrared light emitting diodes 26a-26d, the IR beam emitted by the system 10 has four times the peak intensity of a single IR transmitter, thereby permitting greater discrimination in the calibration function described below. Covering the components on the circuit board 24 are two transparent plastic covers 38 and 40, which permit the transmission and reception of infrared light. FIG. 4, FIG. 5, FIG. 6, FIG. 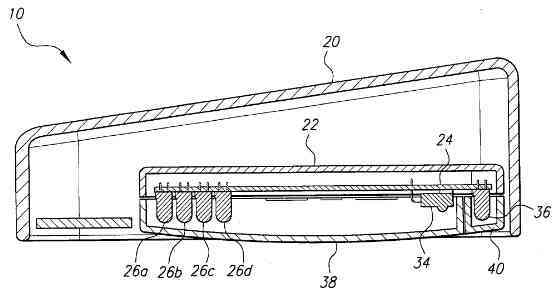 7 illustrate an alternative embodiment of the present design in which a portable portion of the detector 50 is slidably received by a shoe connector 68 clipped onto the frame of an external side view mirror 52 by means of a steel clip 66. The shoe connector 68 makes electrical contact with an insert-molded plate 56 on the detector housing 54. Four wires molded into the detector housing 54, make contact with a terminal strip 64 on the shoe connector 68 and contact the detector's printed circuit board 58 on the inside of the detector housing 54. A cable, not shown, supplies power to the shoe connector 68 from a voltage source within the vehicle 14. Three setscrews 70a-c allow for pitch and level adjustments while giving the detector 50 a firm attachment to the vehicle 14. A further embodiment of the present design provides for a nickel cadmium battery disposed within housing 54 to preclude an external cable connecting the detector to a voltage source within the vehicle. It will be seen that the embodiment of FIGS. 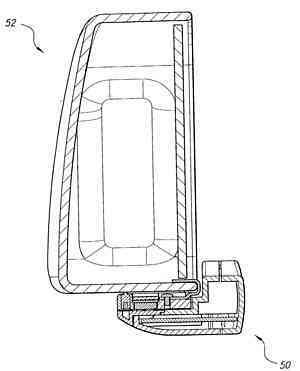 1-3 is built-in or made integral with the side view mirror for original equipment manufacture, while the embodiment of FIGS. 4-7 is a retrofit installation for aftermarket attachment to an existing side view mirror. FIG. 11 illustrates a further embodiment of the blind-spot detector system 110, wherein the housing 108 is integrated into the bottom of a full size mirror assembly 106. When power is first applied to the detector system 10, such as when the vehicle's ignition is turned on, the detector system 10 enters a calibration phase during which the status indicator 36 is illuminated red. As shown in FIG. 10, the output power of the infrared LEDs 26a-26d is increased in linear steps from a minimum "System Integrity Level" 102, to a predetermined "Calibration Level" 100. This linear step function of the output power of the LEDs is repeated every 100 ms. The detector system 10 is properly calibrated once the detector 10 senses the rear quadrant of the vehicle 14 when the combined output power of the LEDs is equal to the "Calibration Level" 100. If the detector system 10 senses the vehicle at a power level less than the "Calibration Level" 100, or completely fails to detect the vehicle, the detector system 10 will remain in calibration mode with the status indicator 36 illuminated red. The detector system 10 enters operational mode and the status indicator 36 changes from red to green once the detector system 10 is physically adjusted to meet the aforementioned calibration requirements. 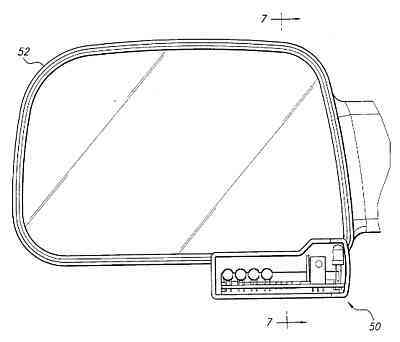 Hence, the user repositions the side view mirror until the indicator LED is illuminated green, signifying that the system is properly positioned to detect an object in the blind area not directly observable in the mirror. If the indicator light remains a solid or nonblinking red, this signifies a malfunction in the detection system, which may occur, e.g., when the IR transmitters or detector are obstructed by snow or ice, or when the beam is not properly aimed at the blind area. As further shown in FIG. 10, the range of transmitted infrared power between the "System Integrity Level" 102 and the "Calibration Level" 100 is designated the "Normal Operation Level" range 104. Once the detector system 10 is in operation mode, an object 16 detected when the transmitted power is in the "Normal Operation Level" 104 will be determined to be a valid "contact". The closer the object, the lower the required infrared power needed to detect it. Status indicator 36 will continue to flash red while an object 16 remains within the "blind spot" 12. At maximum power, an object 16 can be detected at approximately 15 feet from the vehicle 14 within an angular radius of approximately 60° from the vehicle. The detector system 10 undergoes continuous system integrity testing while in operational mode. Infrared radiation transmitted in accordance with the linear step function shown in FIG. 10 will detect the presence of the rear quadrant of the attached vehicle at the "Calibration Level" output power, and will signal to the operator proper functioning of the detector system 10. As shown in the functional block diagram of FIG. 8, one embodiment of the present design has a microcontroller 80 with executable program code stored in a memory device 82. The microcontroller 80 controls the timing and output power level of infrared LEDs 26a-26d through custom logic 88 and resistor network 90. 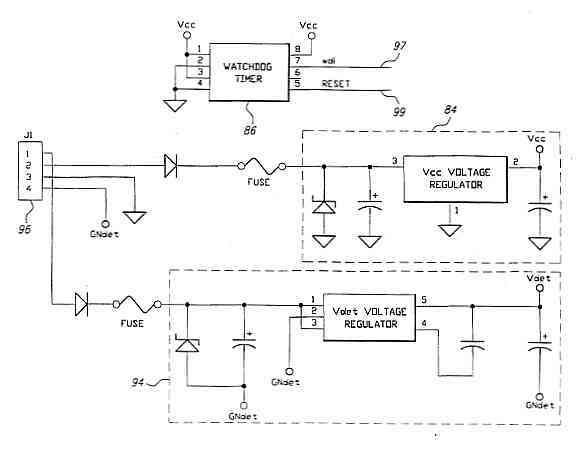 A watchdog timer 86 monitors the operation of the microcontroller 80 as it executes the stored program code and resets the microcontroller 80 in the event the microcontroller 80 fails to reset the watchdog timer 86 within a predetermined period of time. As further shown in FIG. 8, infrared energy is detected and demodulated by infrared photodetector 34, the output of which is monitored by the microcontroller 80. In order to prevent electronic interference from the transmit portion of the circuit from affecting the infrared photodetector and demodulator 34, the transmit portion and the infrared receiver portion derive their power from separate power sources, 84 and 94 respectively. 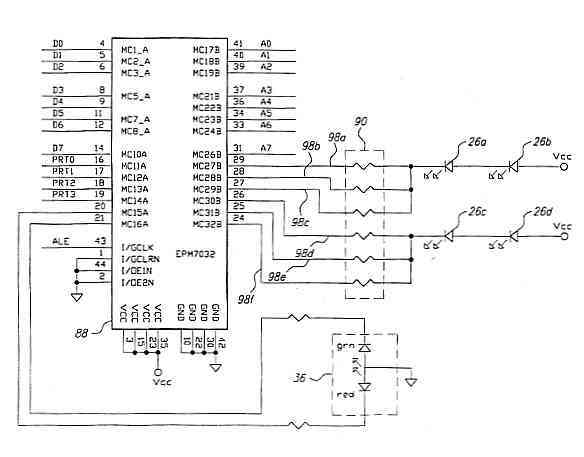 To further decouple the transmit logic from the receiver logic, the output of the photodetector and demodulator 34 is optically isolated from the input to the microcontroller 80 by means of an optical isolator 92. As known to those skilled in the art, there are many different ways the functional block diagram of FIG. 8 may be implemented, and the functional schematic shown in FIGS. 9A-9D is but one embodiment of the present design. As shown in FIG. 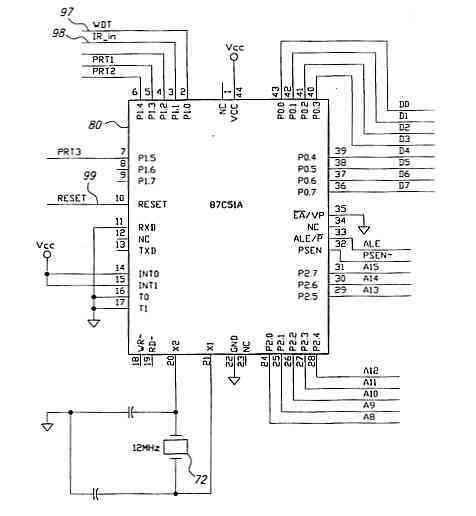 9A, a microcontroller 80 derives it clocking from a 12 MHz. crystal oscillator 72 and executes program code stored in an electrically programmable read-only memory (EPROM) 82 shown in FIG. 9C. Referring to FIG. 9B, a custom Complex Programmable Logic Device (CPLD) 88 is in electrical communication with the microcontroller 80 and generates signals 78a-78f, which ground LEDs 26a-d through resistor network 90. The values of the individual resistors in the resistor network 90 are different, and the CPLD 88 is programmed to apply an appropriate bias to the LED transmitters 26a-26d at the proper time to create the calibrated intensity levels shown in FIG. 10. The CPLD 88 also sends the timing signal of the staircase or sawtooth variation in power intensity to the microcontroller 80. In addition to controlling the output power of LEDs 26a-26d, the CPLD 88 frequency modulates the output power at approximately 40 Khz to minimize the effect of stray infrared energy on the operation of the detector 10. Infrared light reflected from an object within the vehicle's blind spot is detected and demodulated by infrared detector 34. The detector 34 is a standard 40 kHz IR detector, such as a Sharp GP1UD26XK Series or equivalent IR detector, of the type frequently employed in remote control receivers. The output of the detector and demodulator 34 is optically connected to an input of the microcontroller 80 by means of optical isolator 92. Under control of the program code stored in the memory 82, the microcontroller 80 illuminates the status LED 36 shown in when the reflected beam is at the frequency applied by the CPLD 88 in accordance with the aforementioned functional description, the indicator LED showing either flashing red or steady red depending upon the point in the staircase power intensity waveform that the reflected IR beam is detected. Status indicator LED 36 is a red and green bi-color LED with a common anode which illuminates green when the detector is operational, flashes red when the detector system 10 has detected an object within the detector's blind spot, and is a continuous red indication during initialization and when the detector system 10 has failed system integrity testing. The watchdog timer 86, shown in FIG. 9D, is similar to a retriggerable monostable multivibrator, or "one-shot", and will generate a "reset" signal 99 which will reset the microcontroller 80 if the timer does not receive a "keep-alive" signal 97 from the microcontroller within a predetermined period of time. FIG. 9D also illustrates power supply circuits 84 and 94, which supply power to the infrared transmitter circuitry and the infrared detector circuitry respectively. Power is impressed upon the circuit by means of a connector 96 mounted on the circuit board 24. A cable, not shown, in electrical communication with a voltage source within the vehicle 14, supplies sufficient current at approximately 12 volts DC to operate the detector 10. 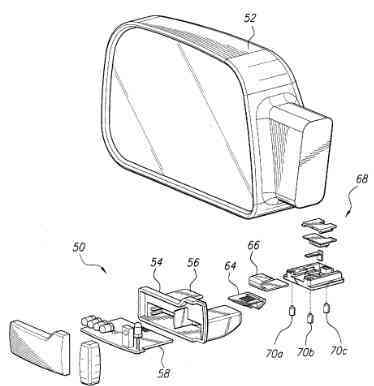 Advantageously, the use of programmable integrated circuits permits the blind area detection system 10 to be housed as an integral unit in a small, compact housing mounted in or on the vehicle's side view mirror.